Exhibit presented at the Annual Meeting of the Radiological Society of North America, Chicago, November 1987. Hallux valgus is a common foot disorder of several etiologies, which can lead to significant foot pain and deformity. Little has been published in the radiographic literature about the pre- and postoperative radiographic findings of this very common and very treatable cause of foot pain. The term hallux valgus denotes deviation of the great toe toward the fibular border of the foot. Hallux valgus is not synonymous with bunion, which is derived from the same root as “bun” or “bunch”, and means an area of swelling. In connection with the foot, bunion usually refers to the prominent medial portion of the first metatarsal head and especially to the bursa or a bursa plus osteophyte over it, when this exists. A bursa and/or osteophyte may or may not accompany hallux valgus. The etiology of hallux valgus is somewhat controversial. 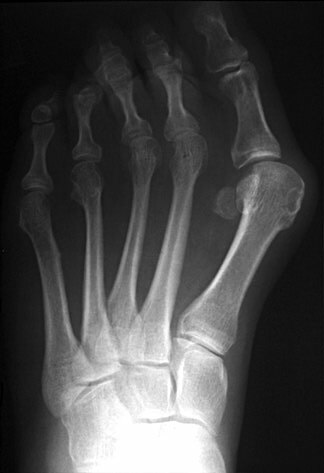 Some cases are congenital, perhaps secondary to a sloping surface of the first tarsometatarsal joint. When this joint is hypermobile, with or without the normal angle, it is often referred to as an “atavistic” tarsometatarsal joint. Other cases are almost certainly due to environmental factors, such as poorly fitting footwear. The fashionable shoes worn by many women are more constraining than the shoes worn by men and are felt by many authors to be the etiologic factor in most cases of hallux valgus. This would help to explain the 10:1 ratio of females to males seen with this disorder. 25 year old female with normal feet and no shoes. Same patient as figure above, but now in shoes with 3 inch heels. The intermetatarsal angle has widened in both feet, and a functional hallux valgus has developed, due to her constricting shoes. Hallux valgus is often associated with abnormalities in two planes. In such cases, the first metatarsal head is not only deviated medially, but also dorsally. 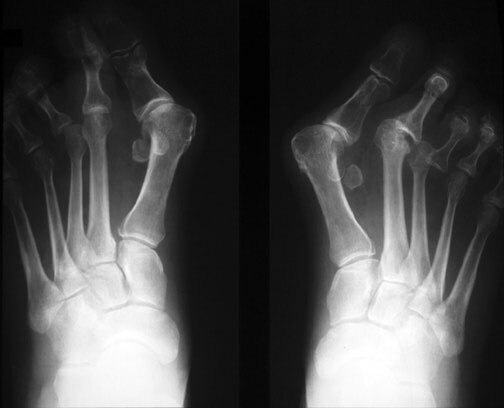 As the first metatarsal splays dorsally, greater stress is placed on the central metatarsals, especially the second, leading to hyperostosis and occasionally stress fractures. Foot with metatarsus primus varus. Dorsal splaying of both the first and fifth metatarsal heads is noted. Keratosis (dark pink) is seen in the skin adjacent to these heads, due to pressure against the shoe. The central metatarsal heads now bear more of the weight, leading to plantar keratosis and hyperostosis. The malalignment of the foot seen in hallux valgus manifests itself in the vertical dimension as well. Normally, the 1st and 2nd metatarsals are parallel to each other, and their superior surfaces appear within 1 - 2 mm of each other, as shown here. Some patients with metatarsus primus varus demonstrate not only medial angulation of the first metatarsal head, but also dorsal angulation as well. Here the first metatarsal is elevated several mm above the second metatarsal head. 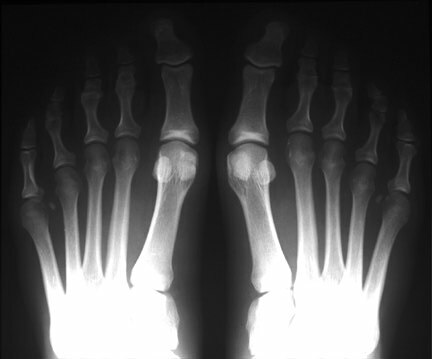 The first metatarsal head and sesamoids also become malaligned with each other. Short axis view of first metatarsophalangeal joint. The two large sesamoid bones are present beneath the first metatarsophalangeal joint within the tendons of the flexor hallucis brevis. With the development of hallux valgus, the 1st metatarsal head migrates medially and dorsally. 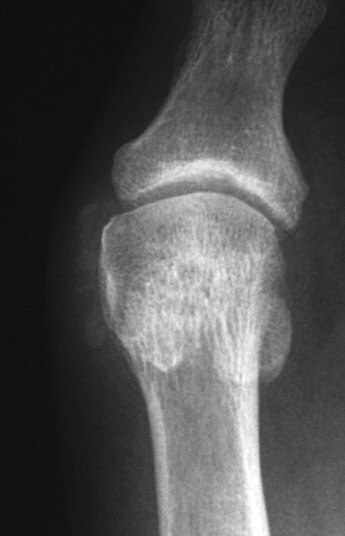 The fibular sesamoid frequently rotates slightly dorsally, and is seen on the AP film in profile. This patient has a marked hallux valgus deformity in both feet. As the first toe migrates more and more to valgus, it presses against the second toe, and may aggravate dorsal clawing of the second toe, which is usually initiated by overload of the second metatarsal and synovitis of the metatarsophalangeal joint. 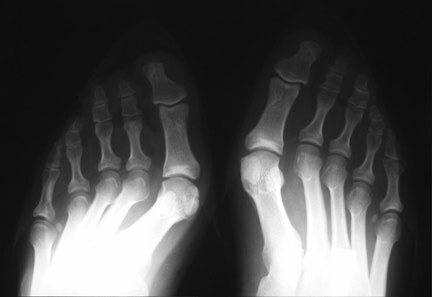 Also note the relative hyperostosis of the second metatarsal shafts compared to the third and fourth, as well as dorsal rotation of the fibular sesamoids. This patient exhibits soft tissue swelling medial to her first metatarsal head, indicative of bursitis and synovial thickening. Also noted is dystrophic calcification in this bursa. Such changes could also be seen in tophaceous gout. Preoperative film showing hallux valgus and clawtoe deformities of the second and third toes. Medial subluxation of the head off the sesamoids is shown, as well as marked hyperostosis of the second metatarsal shaft. Same patient status post Lapidus procedure. With osteotomy of the 1st metatarsal, the 1st metatarsal head has been realigned in a more lateral and plantar location over the sesamoids. The 1st tarsometatarsal joint has been fused. 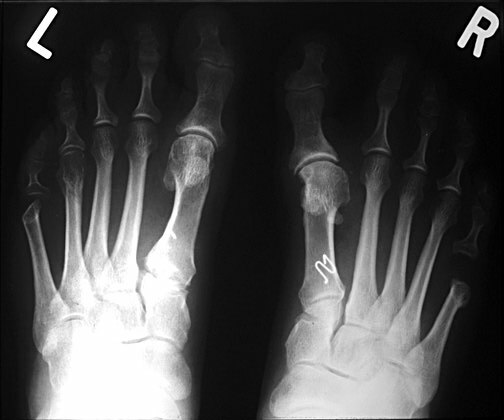 Kirschner wires are seen in the 2nd and 3rd toes after osteotomy for clawtoe deformities. Broken screw following Lapidus procedure. Cancellous screws, especially the thinner ones, usually break at the junction of the shank and the threaded portion. Therefore, this probably represents at least a delayed union if not a nonunion. However, if correct position is maintained, as in this case, and the surgical site is painless, it may be considered a satisfactory result. 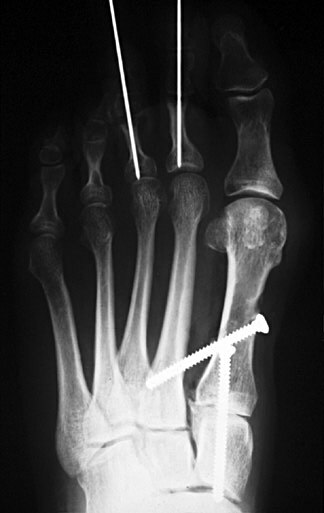 This patient has undergone bilateral osteotomy of the medial 1st metatarsal heads (“bunionectomy”). Unlike the Lapidus procedure, this procedure does not correct the underlying splaying of the 1st metatarsal, and can lead to instability of the first metatarsophalangeal joint. In this case, the hallux valgus has been overcorrected, and the patient now has a bilateral hallux varus. Bilateral osteotomies are noted in the 5th metatarsals for correction of “bunionette” deformities. Hallux valgus is a very common and very treatable cause of foot pain. Hallux valgus cannot be adequately assessed unless weight-bearing views are performed in the AP and lateral positions. With experience, the radiologist can make valuable observations in both the pre- and postoperative films in patients with hallux valgus. Coughlin MJ. Hallux valgus: causes, evaluation, and treatment. Postgrad Med 1984;75:174–178. Frede TE, Lee KJ. Compensatory hypertrophy of bone following surgery on the foot. Radiology 1983;146:347–348. Inman VT. Hallux valgus: a review of etiologic factors. Orthop Clin North Am 1974;5:59–66. Kelikian H. The hallux. In: Jahss MH, ed., Disorders of the foot. Philadelphia: WB Saunders, 1982:539–621. Kilcoyne RF, Farrar E. Injuries and deformities of the foot. In: Handbook of radiologic orthopaedic terminology. Chicago: Year Book, 1986:123–137. Weissman BNW, Sledge CB. The foot. In: Orthopedic radiology. Philadelphia: WB Saunders, 1986:625–670.